People often joke that California, especially Southern California, has no seasons. But of course it does. There's the dry season and the less-dry season; or, if you like, smoggy and less-smoggy. My favorite, though, has always been jacaranda season. As a child in LA, I would ask my mother to drive me to the streets that were most full of blooming jacarandas*, and I would run up and down the sidewalk, collecting freshly fallen flowers. I nested them carefully one inside another, building chains and towers of purple. Jacarandas might well be the reason purple is my favorite color. I used to make plans for how purple my house would be when I grew up. The walls would be painted purple, obviously, inside and out. And the yard would be planted with lavender, lilies of the Nile, and jacaranda trees. 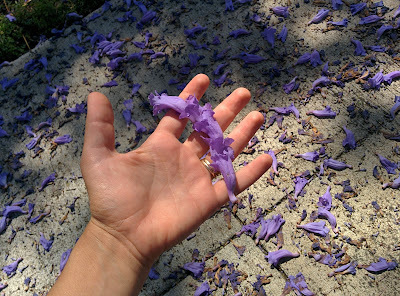 Stacking jacaranda blossoms is harder with big fat grownup fingers. Jacaranda season came to LA last month, and a friend of mine posted her beautiful photos of the bloom along with a link to an LAist article, summarizing the city's history with this iconic tree. 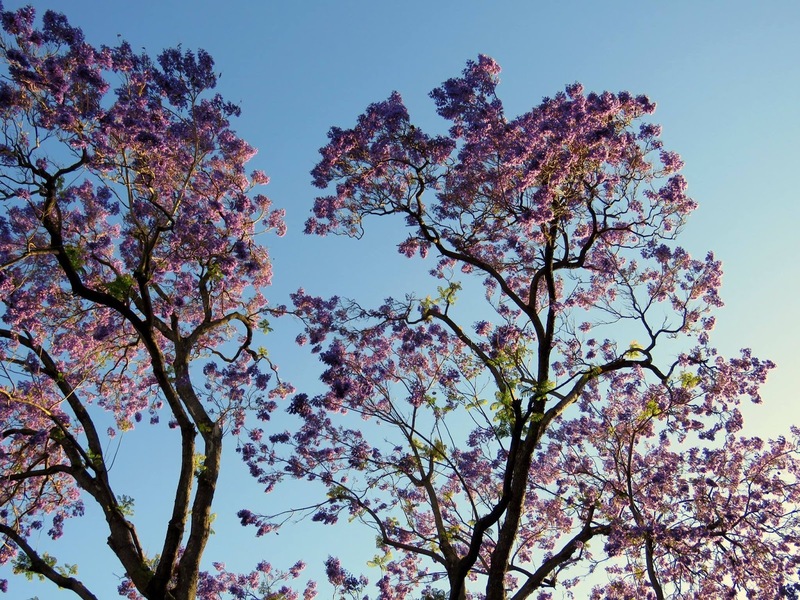 I was delighted to learn than in 2010, there were one hundred and forty-eight thousand, five hundred and thirty jacaranda trees in Los Angeles. We don't have nearly as many in my current northern California neighborhood, and ours didn't flower until this month. However, it seems likely that we owe our half-dozen trees, at least indirectly, to the same horticulturalist who spread jacarandas so far and wide in the south of the state: Kate Sessions. Though she's been likened to Johnny Appleseed and named the Mother of Balboa Park**, I don't recall ever learning about her before. She is fascinating. Born in San Francisco to a family that had rushed there in search of gold, she sought her own enrichment through education. At the University of California, Berkeley, she wrote an essay called "The Natural Sciences as a Field for Women's Labor"--which I'm dying to read, and haven't yet been able to track down. After graduating with a chemistry degree in 1881, Sessions moved to San Diego, where she soon owned a nursery, then a flower shop, growing fields, and more nurseries. She had a knack for finding non-native plants that would thrive in California. Among more than a hundred species she introduced and popularized are the now-ubiquitous bougainvillea (from South America) and bird of paradise (from South Africa), as well as jacaranda (also from South America***). The ensuing century-plus has witnessed many changes, not least (nor hardly greatest) a shift in our attitude toward the introduction of non-natives. Having experienced the havoc of ornamentals-turned-invasives like kudzu and ice plant, we've grown leery of transplanting exotics and nostalgic for the days before weeds. So far as I can discern, Sessions herself didn't introduce anything invasive--due perhaps to foresight, perhaps to luck. Other contemporary introductions were less benign. Eucalyptus in California, for example, has become a controversial tree if ever there was one. And yet I kept the non-native lilies of the Nile that came with the house. How could I uproot them, when I'd dreamed for so long of having my own? In the end, my landscaping choices were not really so different from those of Sessions, who loved and propagated California natives along with her introductions. Perhaps one day I'll even plant myself a jacaranda tree, and drench my native garden with a rain of purple blossoms. 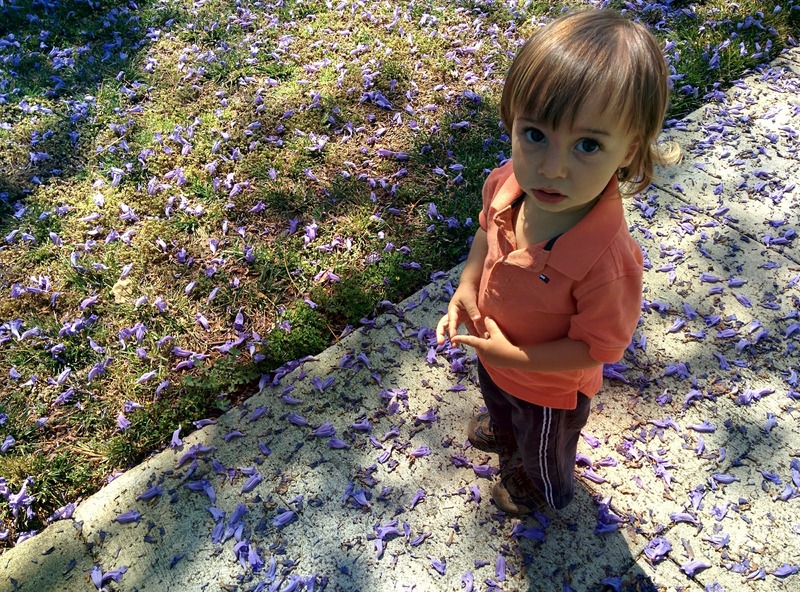 The author's son, nonplussed by a neighbor's jacaranda carpet. * Which is, in retrospect, just about the most quintessentially LA thing I can imagine. ** Balboa Park is the enormous beating green heart of San Diego. Have you heard of the San Diego Zoo? It's inside Balboa Park. *** I've always pronounced the initial consonant of "jacaranda" voicelessly, as in Spanish. The first time I heard someone call them Jack-o-randas, it threw me into an apoplexy. Now I just pretend I didn't hear. Nice post! I adore jacarandas, and you captured their enticing beauty well. t bears mentioning that jacarandas (which I've always heard pronounced with a hard "J") are found all over the tropical world. In northern Australia and Eastern and Southern Africa, they're ubiquitous but no less spectacular for their commonality. English dictionaries all seem to recommend the hard J, which surprises me. I wonder what other Angelinos would say? Perhaps it's time for a poll! Join the OctoPost mailing list! All the news that's fit to ink, delivered monthly. Copyright Danna Staaf. Powered by Blogger.